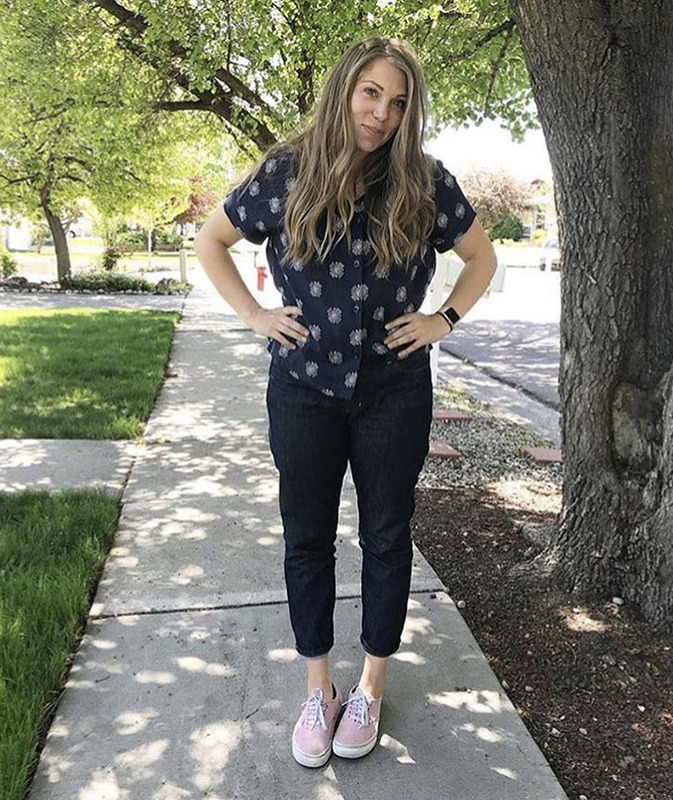 I gave birth to my third child just over 3 weeks ago, and near the end of my pregnancy I began to think a lot of my postpartum wardrobe. Having had two children already I knew I would be slightly uncomfortable with my body for a while even though I shouldn't be. I mean, I did just grow and birth a person with my body and then also feed that person with my body. Its pretty awesome and I think that warrants being able to dress in clothes I like while waiting to fit into my jeans again. I wanted some new pieces that would be comfy and cute with a forgiving fit all while working for the reality of my day to day. Clothes I could answer the door in. Clothes I can run to the grocery store and the doctor in. 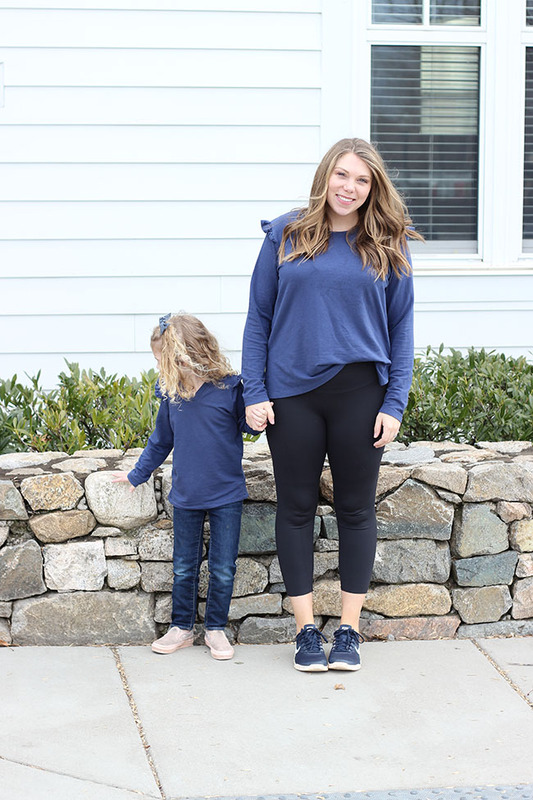 Clothes that can also still be worn when the baby weight is gone. This means - knits! 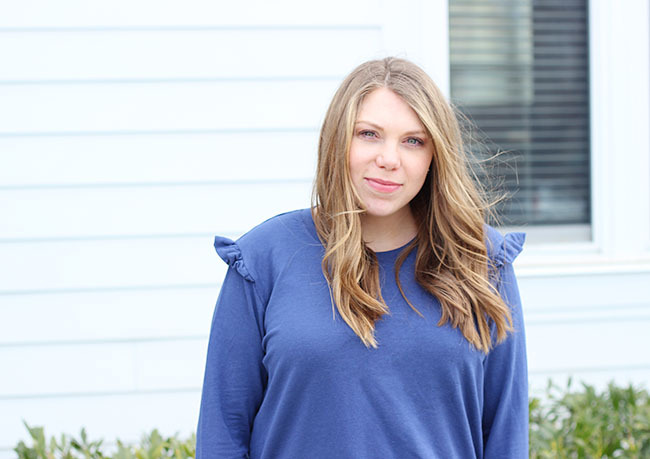 If you follow me on Instagram, you may be aware that while mainly a woven fabric girl, I'm also a die-hard fan of a few types of knit fabric, one being this cotton bamboo french terry. 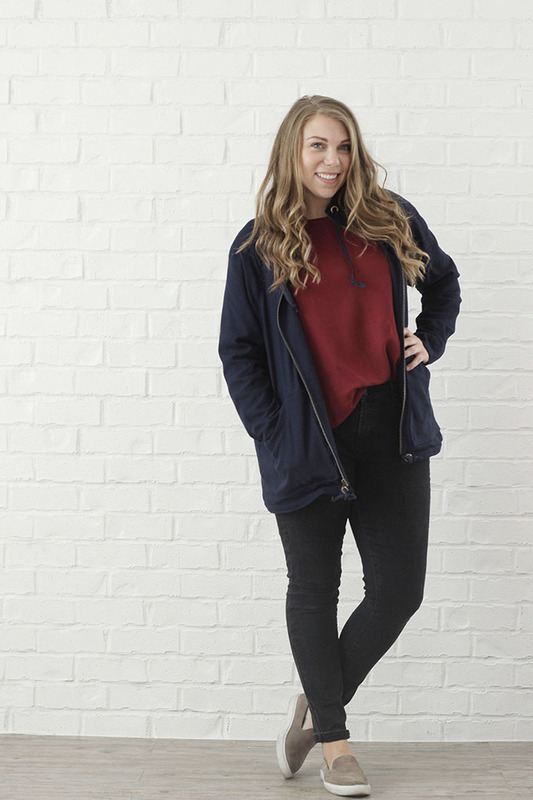 Its great for lighter weight sweaters that are comfy, cute and fit all the time. Its especially fabulous for the postpartum phase I'm in. So today I'm going to talk all about this heavenly fabric and all the things I've made with it. Its a work horse in my closet right now! Note: I love this fabric and have bought so much of it that I reached out to Telio to see if they would be interested in collaborating. I received this fabric for free but they didn't ask me to rave about it. That's all me! This fabric is medium weight with great drape but not too much. You know how sometimes when sewing with rayon knits they seem too heavy even they though they aren't? They have too much vertical stretch causing them to grow, getting longer and longer. They also tend to be more thin and clingy and show your whole body underneath. This does not do that! 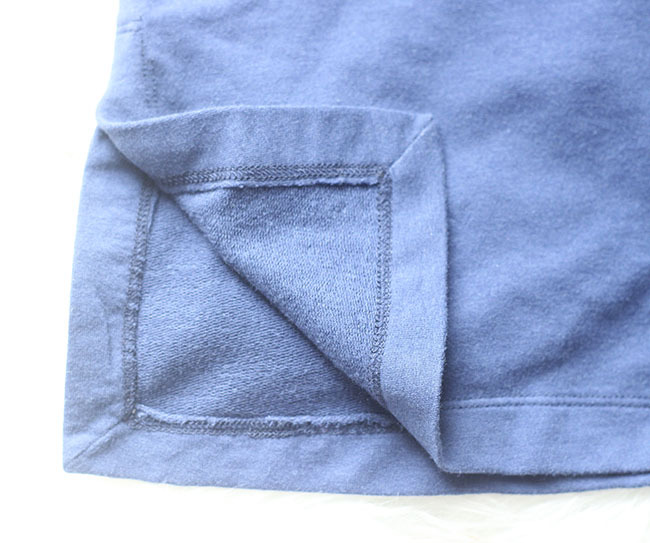 But its also not as stable as a cotton spandex french terry. It is the absolute perfect hybrid. Buttery soft, just drapey enough and not clingy. And it doesn't pill! As for the stats, its super wide - 62 inches. 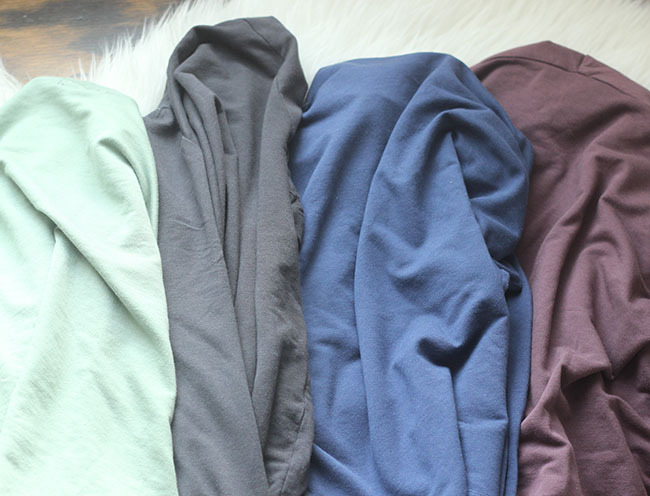 Its 67% rayon of bamboo, 28% cotton which adds that little bit of stability and makes it not clingy, and 5% spandex. 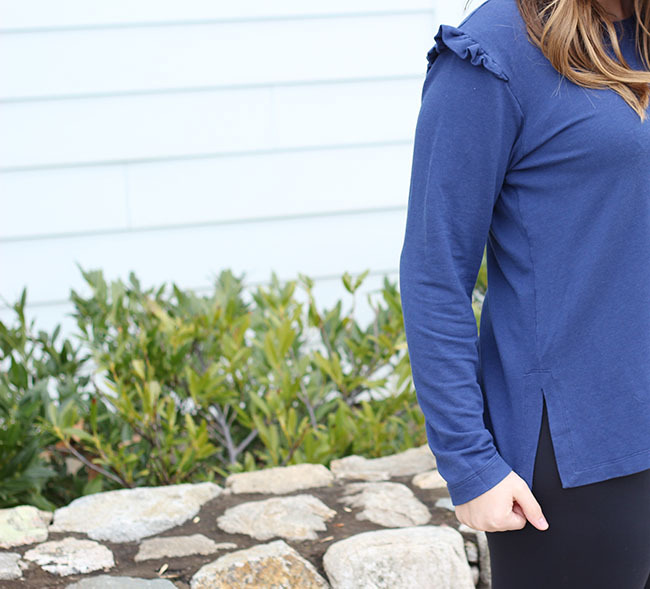 I've sewn this fabric up into four different popular but also totally postpartum friendly sweater/top patterns with different types of sleeves so you can see how it looks and drapes. 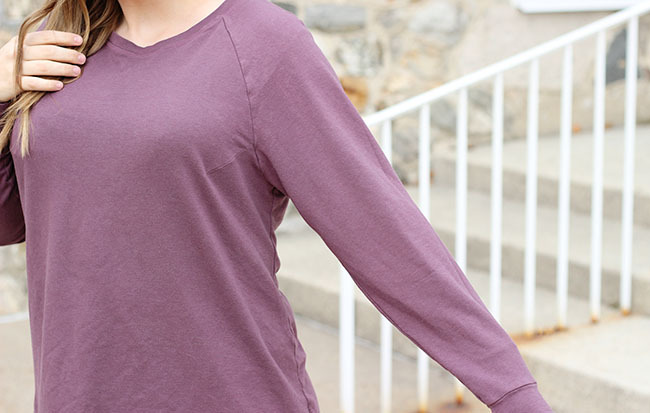 I've sewn a raglan, a set-in sleeve, a dolman, and a raglan/dolman hybrid. Also I sewed these up while pregnant. So in preparation for wearing them postpartum I sized up some of these patterns and not others depending on the finished garment measurements provided in the patterns. My bust is currently larger than any of the sizes I actually made (pre-pregnant 38.5 in., currently 42 in. due to nursing) but since this fabric is so soft, stretchy and drapey they work well now and will just look slightly looser later. 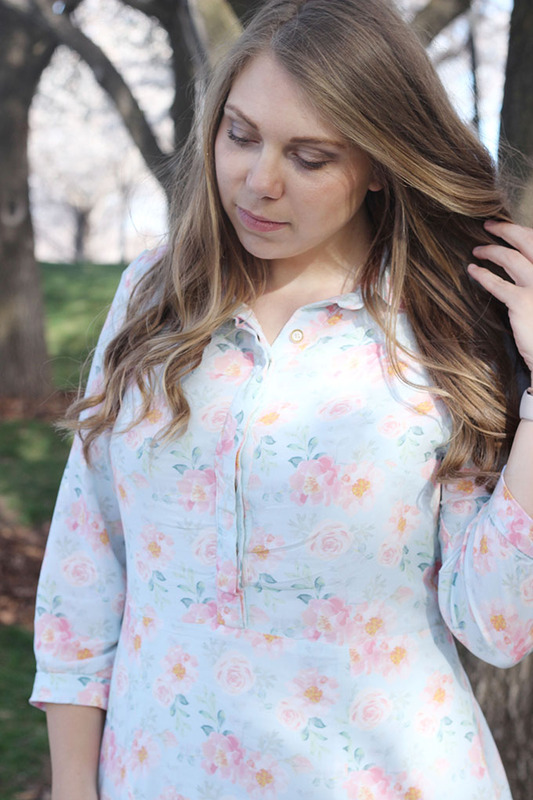 This fabric is also the perfect weight for late winter/early spring and layering but could even do well in warmer weather with shorter sleeves. This pattern also comes with loads of options. 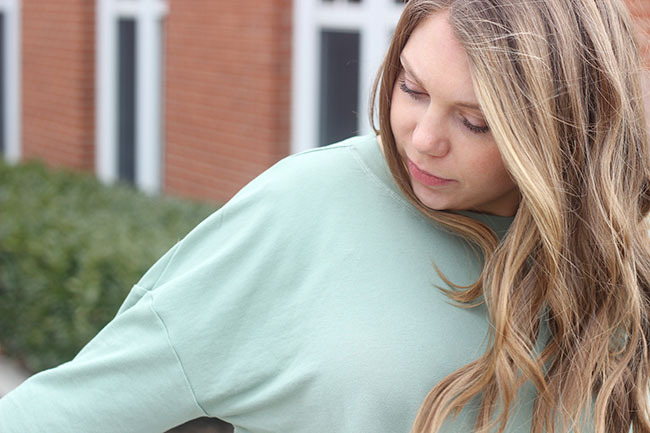 Different sleeve types, a funnel or crew neck and cropped, tied, banded or curved hem. Because the finished measurement in the bust has 8 inches of ease, I decided to make my pre-pregnant size. What I did not take into consideration was the length of this top. It will be great with high waisted jeans but for now I can pretty much only wear it with really high leggings. I should have added at least an inch in length (I'm 5'8"). But eventually I hope to get tons of wear out of it. This fabric is great for the tie hem view. 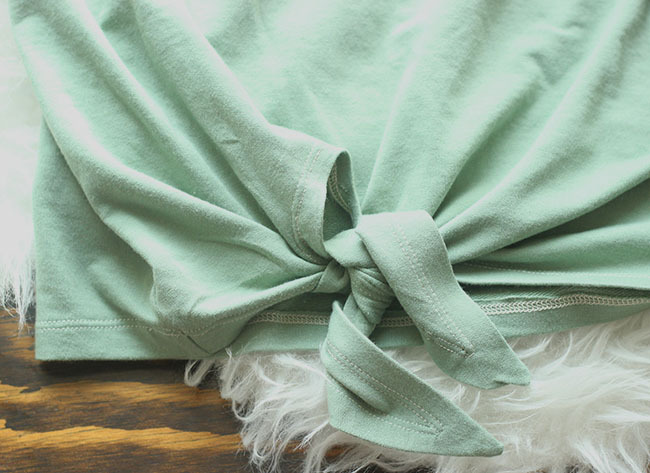 It can still tie up easily and drape well without creating a huge bulky knot. 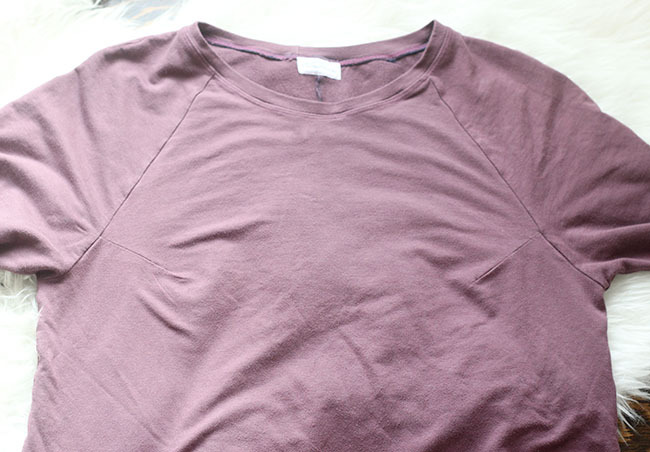 It's also excellent for a dropped/dolman sleeve. 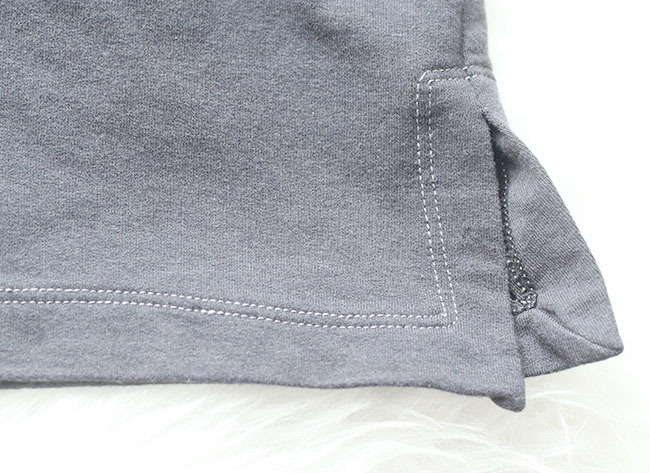 Using a fabric that's too thick or stable can create a lot of extra bulk under your arm but in this fabric its just soft, light and airy with the drape of the fabric under there. 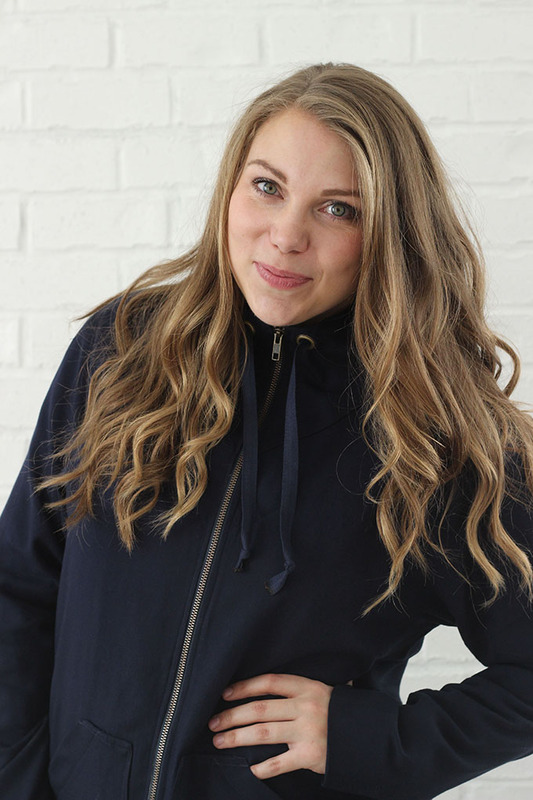 Another work horse of a pattern, this has tons of options including a hood, thumbhole cuffs, regular cuffs, and a kangaroo pocket in addition to sleeve variations. It has a slimmer fit and more shaping though the body than the others so I sized up one size again. 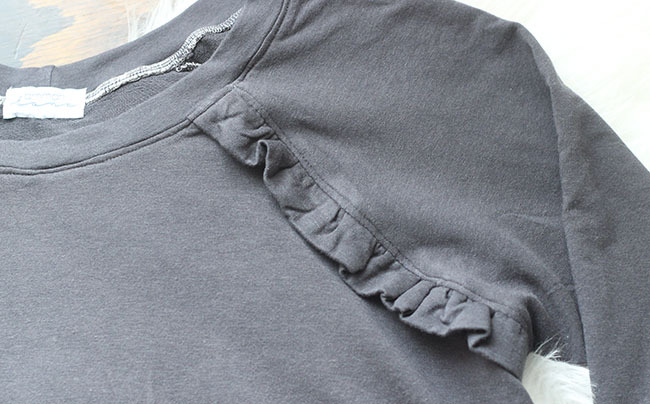 I also added my own ruffles at the raglan sleeve to once more elevate the casual feel of it and highlight how incredible this fabric is - gathering so well even with two layers. And again I added side vents because #always. 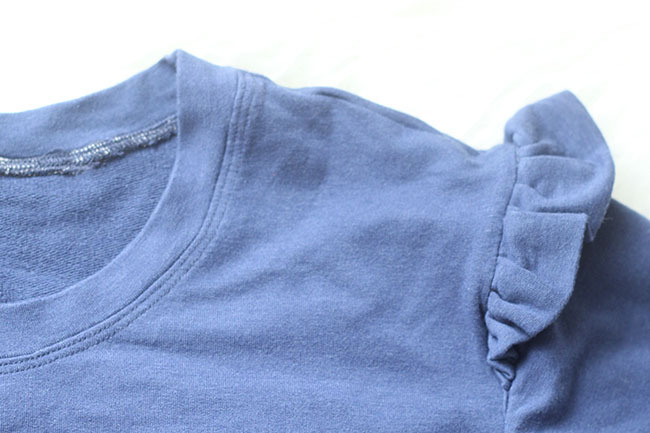 A raglan sleeve is another shape that can cause unwanted fabric under the arm or bust area in the wrong fabric, but with this magical unicorn fabric, the underarm fabric isn't noticeable at all. 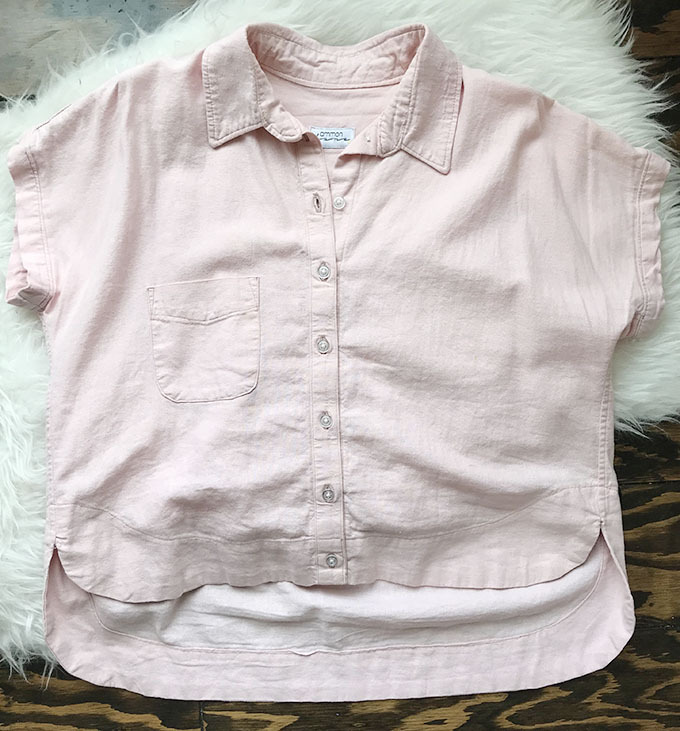 And with the extra room I will have in the top later, I think it would be awesome for layering over a button up collared shirt. So, which top is your favorite? Would you make any of these or sew this luxurious fabric into something else? What it would be - let me know! I did manage to keep track of everything I sewed this year; how many yards I sewed, how many yards I bought, how many patterns I bought and how many of those I have sewn since buying. Because tracking keeps me aware and should hypothetically help keep myself in check. Especially as I wanted to sew my stash this year and buy less. I'll review the progress of all my goals below, but I can say my stash has shrunk a lot. Like a lot a lot. Partly because I just admitted to myself which fabric purchases were duds and aren't my style and I donated them. I donated loads of scraps and full yardage to a shelter down town that teaches refugee women to sew and I feel great about that. 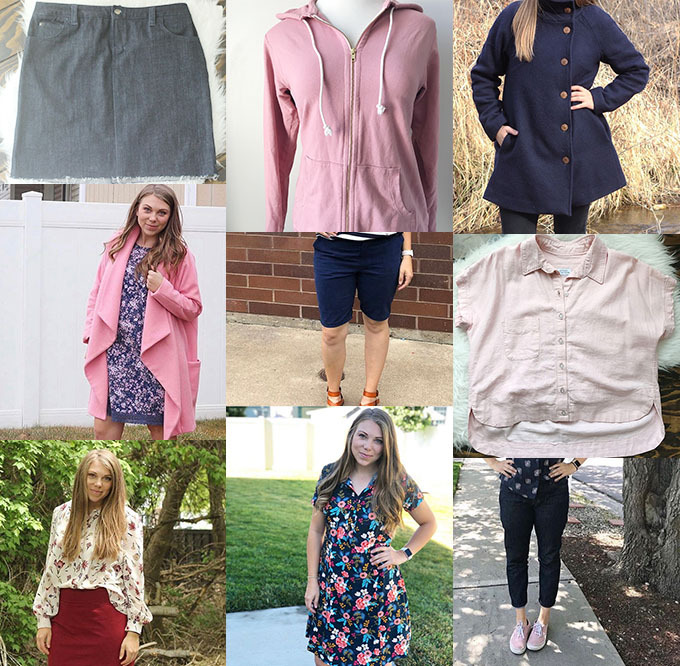 So since this is a review of my sewing for the year, I'll review my goals, my make nine, what I've sewn, who I've sewn for, patterns I've bought, and how I'm feeling about the year. So here we go - lets start with my Make Nine from last year. The only thing I swapped out was the Sew Over it Alex shirt because I realized it didn't have a collar stand and I wanted a button up shirt with a real collar. So I made the Kalle Shirt instead and I LOVE it. I made 2 and have plans for me. Then, because I loved the shape of that shirt so much I also made the melilot, another dolman button up but with a much slimmer silhouette and am digging it too. I see more of those in my future as well. 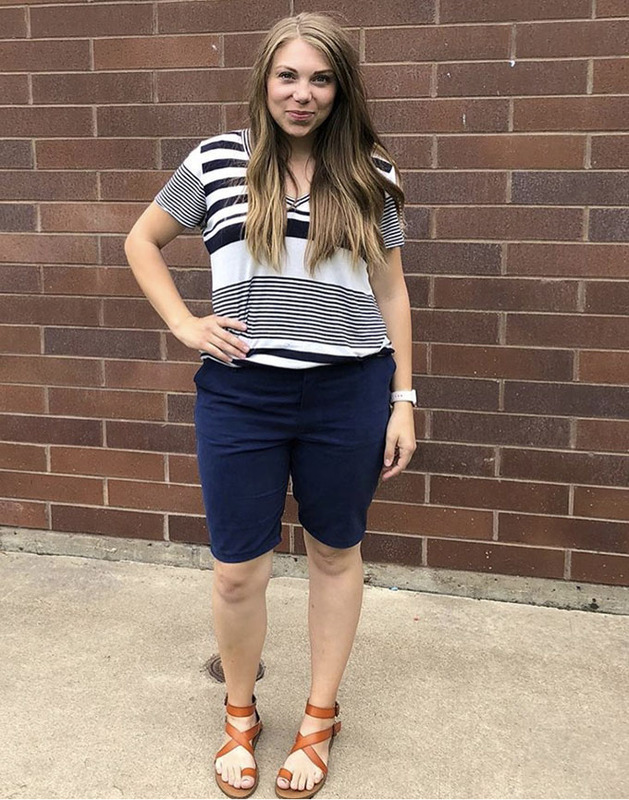 I made the knee length shorts version of the Chi-Town Chinos and they also became a quick favorite. In fact, I made two pairs and wore them all Summer. I also made two Sarah Shirts and two of Mcalls 7380. I think two is a trend for me. I also have more pairs of Morgan jeans planned for this year. 1. 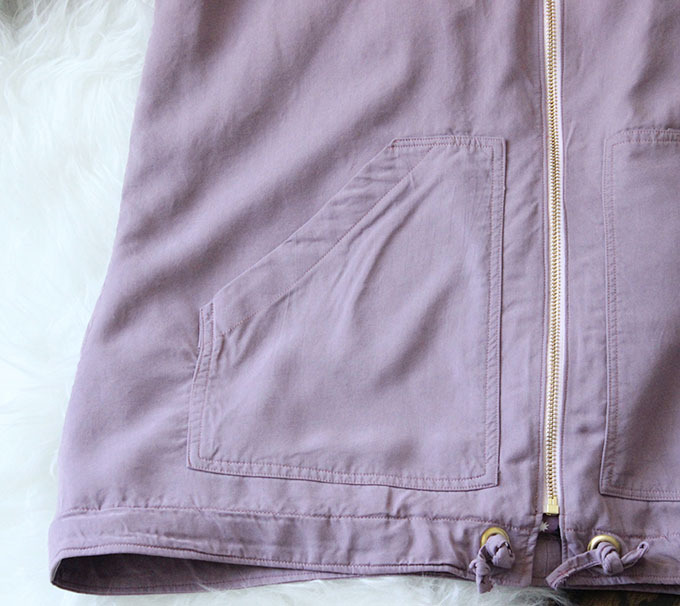 Sew less. Meaning, slow down and don't sew so many items because I don't need a lot more. This did not happen. Granted, I made much nicer, quality pieces and my old ones have pretty much all been donated, rehomed, or turned into something else. 3. Be patient. Take time to make the right adjustments so that garments turn out better and fit great so that I love them when they're done. This I did, too! I feel really happy with the garments in my closet. They fit so much better and I love wearing them. Im very grateful I took the time to learn the adjustments I need and then actually take the time to do them. And a note on that, you don't need fancy fitting books or to take a class to figure this out. I highly recommend this youtube channel, where I learned all the adjustments I make. 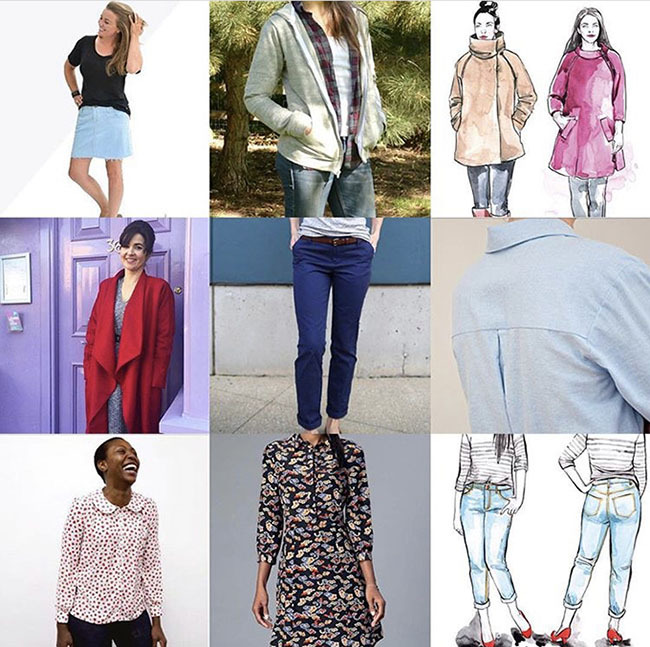 Also a lot of patterns, like jeans patterns, come with fitting guides and blog posts to walk you through issues you may be having. You don't need to invest a bunch of time and money to figuring out fitting. Ok so you need to invest some time...but that's it. I bought 88 yards of fabric (yikes) and sewed 177 yards of fabric. I have kept it at a 2:1 ratio of sewn yardage to bought yardage all year and I'm so proud of that. And I'm happy because the fabric in my stash is stuff I love. I have waisted a lot of money in the past buying fabric I later learned I didn't like. So now the fabric I do have is fabric worth owning, sewing, and wearing and that makes me feel good. Its also almost all solid colors which I'm totally down with and different from years past. Alright well if all of that info didn't overwhelm you its a miracle! But I like to have this information to look back on and compare to other years. 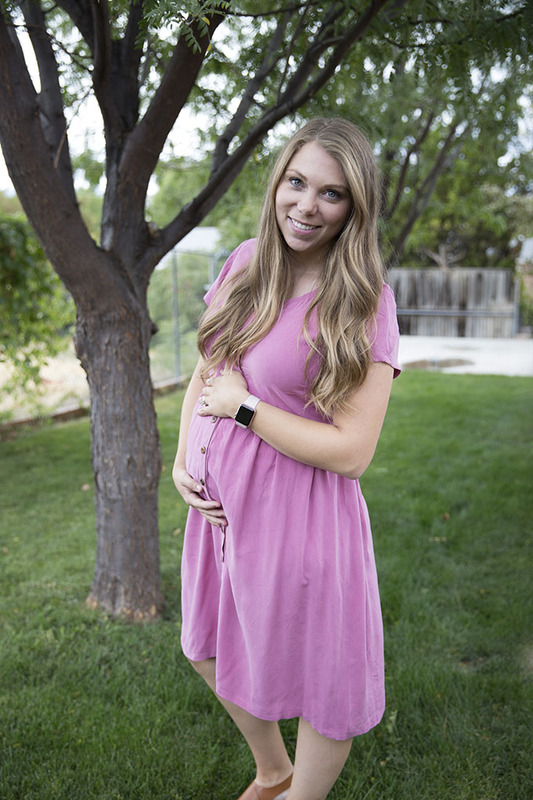 I am still solidifying my plans for this year but since I'm expecting baby #3 in 4 weeks, I want to be realistic about my time and energy, and also what I will wear. So I'm taking my time and being deliberate about it. Same with my goals, but I'll share them when they are all ready! Alright sewing friends, like I mentioned in my Sewing Misses post, this year was so good in the sewing arena. I had so many hits and so few misses that these posts have been hard to write. They were hard to write last year too, but for the opposite reason. So many misses it was hard to narrow it down! I spent quite a while narrowing my hits down to five, so these patterns that I'm sharing here are serious winners in my book. There are others I super love and only very narrowly missed this list. I also must mention - I am the literal worst at getting photos of my makes. 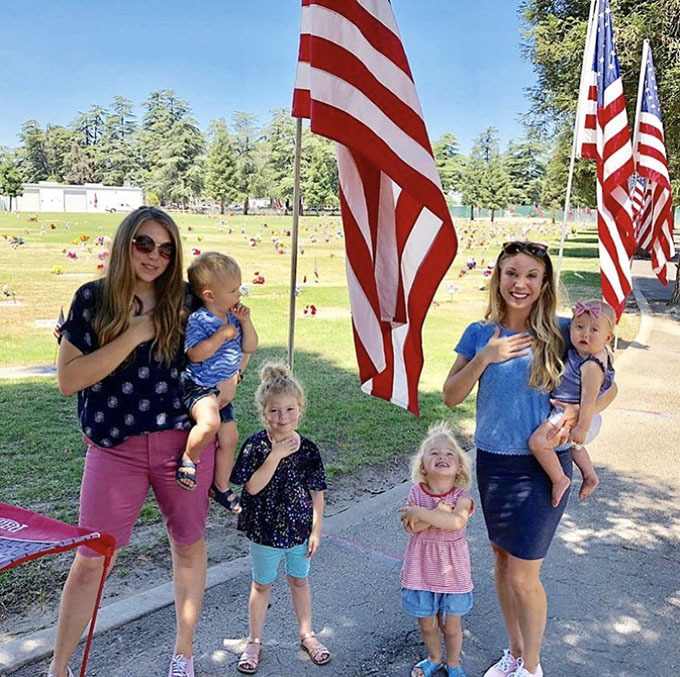 It takes so much time planning and with two kids and one on the way its been harder than ever this year. And of course now that I want to snap photos in them for you, I'm way too pregnant to fit into most. So you get some real life crappy photos taken throughout the year in places like Harry Pitter World, random parks, the cemetery on Memorial Day, etc. You're welcome:) At least its proof these patterns are tried and tested and worn on the daily. This is a Melissa Watson pattern with Palmer and Pletsch fitting instructions so its easy to get a great fit the first time. 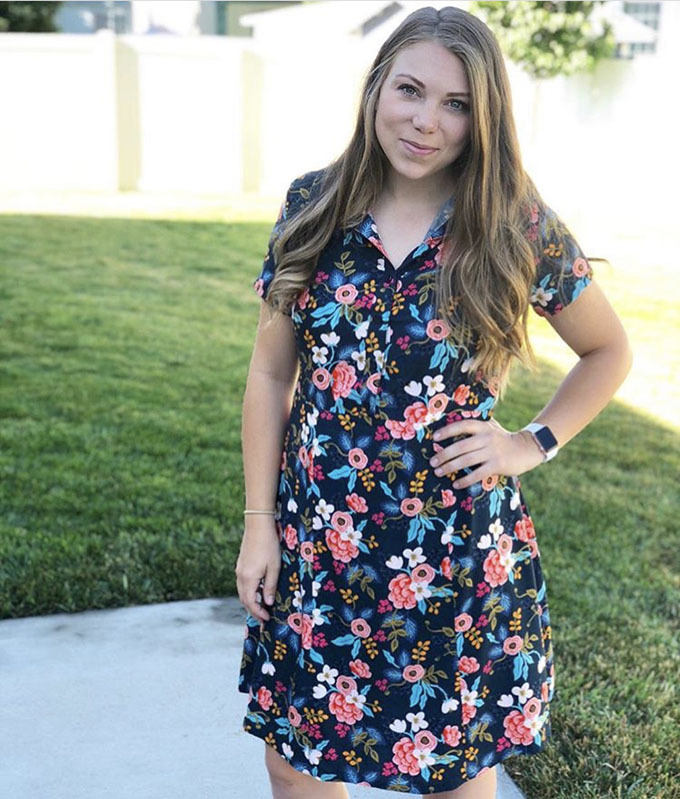 Its a shirt dress with buttons down to the natural waist, a hidden button placket, collar and collar stand, 3/4 sleeves (or sleeveless option), a partial elastic back for a comfortable fit, and an a-line paneled skirt with a curved hem. This dress is so flattering on me and a style I love. I've made these two, both out of rayon challis, but I want to make another one next year in a solid color. Maybe in a tencel twill or rayon linen. I did make some alterations to get this look. I added 3 inches to the skirt to get it knee length and added more length to the sides which reduced the dramatic curve of the hem. 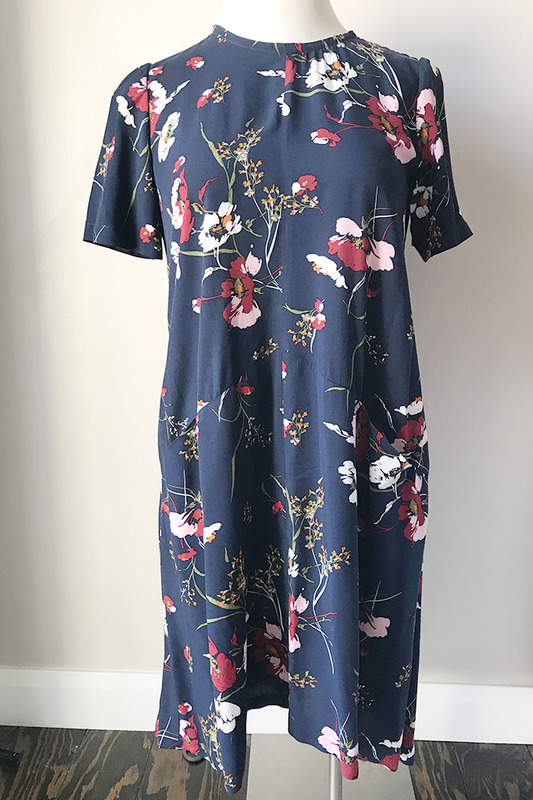 In the navy one, I altered the pattern to use the short sleeve from the highlands wrap dress, and I did an exposed button placket instead of concealed (although you can't really see it in this busy print.) I have a blog post on it here if you want to see and read more. This is such a versatile and useful pattern to have. I have the full expansion pack which gives you mid thigh shorts, skirt, full pants, and these knee length Bermudas. They are a chino style without a true waist band, but a waistband facing that comes together really nice and looks great. They have a center back extension which makes adjustments for all sizes really easy, no matter what your waist to hip ratio is. My only adjustments were to add 1.5 inches to the rise to get a higher mid rise instead of the true mid rise they come with. And I slimmed them quite a bit just because my upper thigh is so much larger than my lower thigh so they were enormous at the bottom. But that is super easy to do. I absolutely love this pattern and wore them loads this spring and summer. Like to my sister's home in California, to Harry Potter World, and everywhere else I went every day. Its shocking how much I wore these tops this year and yet I have no photos. So let these photos suffice. 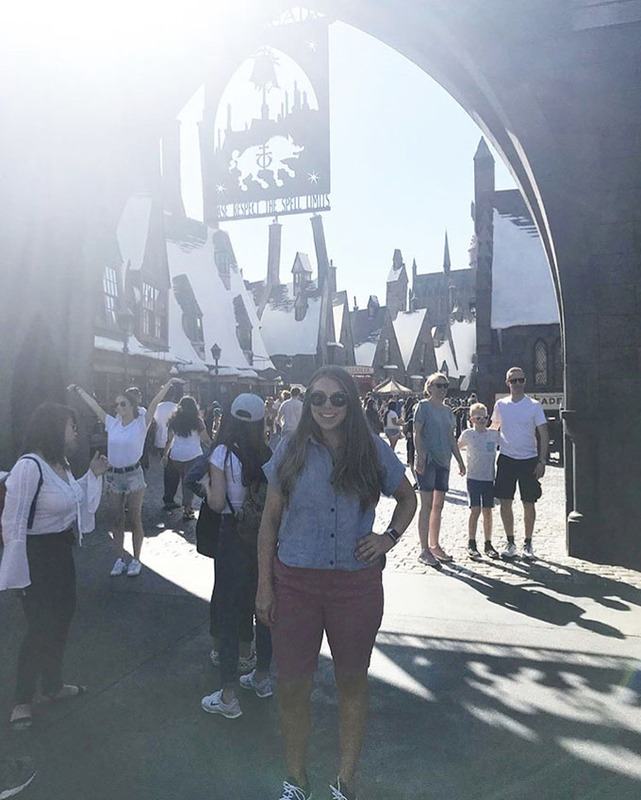 And although that's a horrible quality photo from Harry Potter World (paired with my pink chi town chinos) it shows I really wore these eveywhere. I've made two of these, both in the cropped view with 3 inches of length added. After I have the baby I plan to make the tunic one (in a regular shirt length without such a dramatic curved hem in the back) and the dress. I want all the versions. The cropped ones (with added length) are easy to wear with my gingers, morgans, chi towns, and basically all other bottoms that I have. There are plenty of options in this pattern but both of mine are full button ups with the collar and collar stand. Maybe I'll make the popover version with a mandarin collar next. And both of mine are made in rayon linen, which I love for this shape. Just enough structure for a button up and to show the body of the pattern, and also enough drape as to not add too much bulk from quite a boxy top. But I think for the true shirt length and dress I'll use something with more drape like a rayon poplin, challis, or tencel. I made my first Farrow last year and liked it, but it was enormous. I mean, it fit as intended but huge tent dresses don't look great on me. So this year I figured out the perfect fit for me (a 12 graded down to a 6 - I have a whole post on that here) and this year made two more. The navy one I haven't really been able to wear yet. 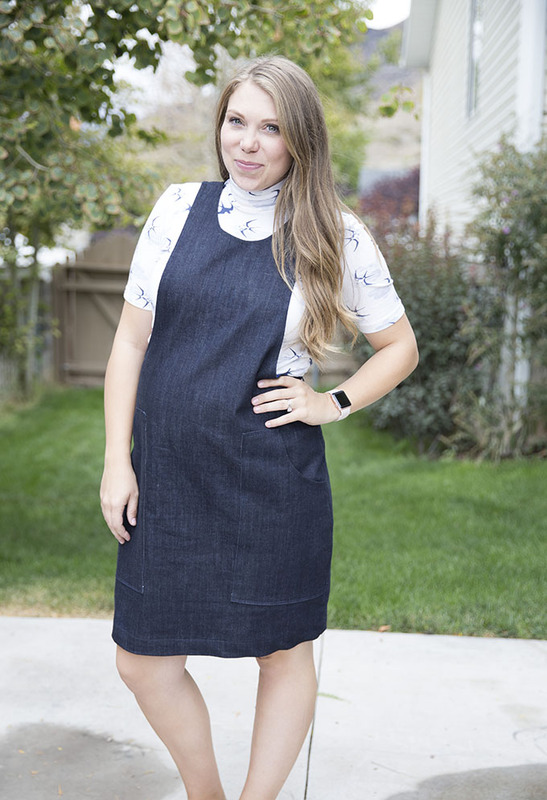 I wore it once but then I was too big for it (I made it while pregnant) so I'm just waiting to have this baby and then it should be the perfect loose fitting postpartum dress. If you go by your measurements and make your actual size, you could wear this your entire pregnancy which would be a plus. My adjustments to this pattern were the sizing changes, a broad back adjustment, shortening the sleeves and adding 3 inches in length. 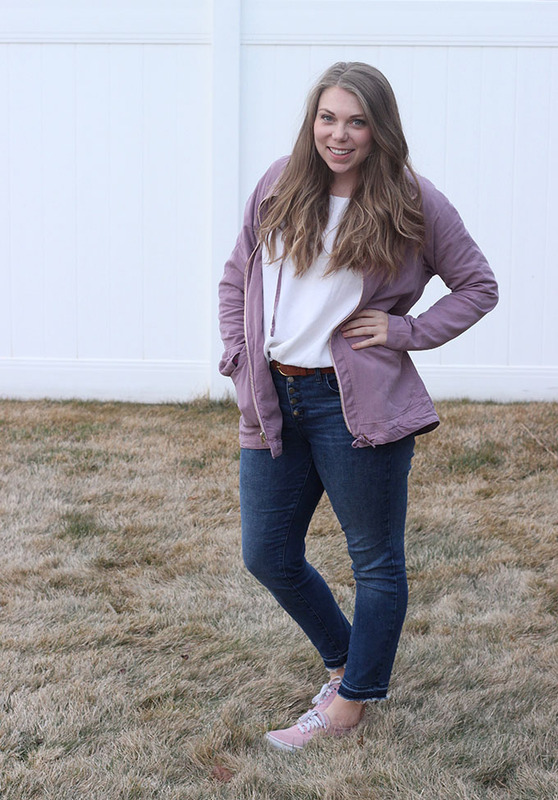 Favorite jeans ever! Button fly, non stretch denim, cropped length. I absolutely cannot wait to make more pairs next year. I made these in a 10oz rigid denim from Threadbare Fabrics. Next I want to try them in a heavier fabric and with an exposed button fly. I love the rise on these. Its called a mid rise but its quite high on me still and although I always love a a true high rise, I find this rise the most flattering and comfortable on me. I want this same rise on all my jeans. 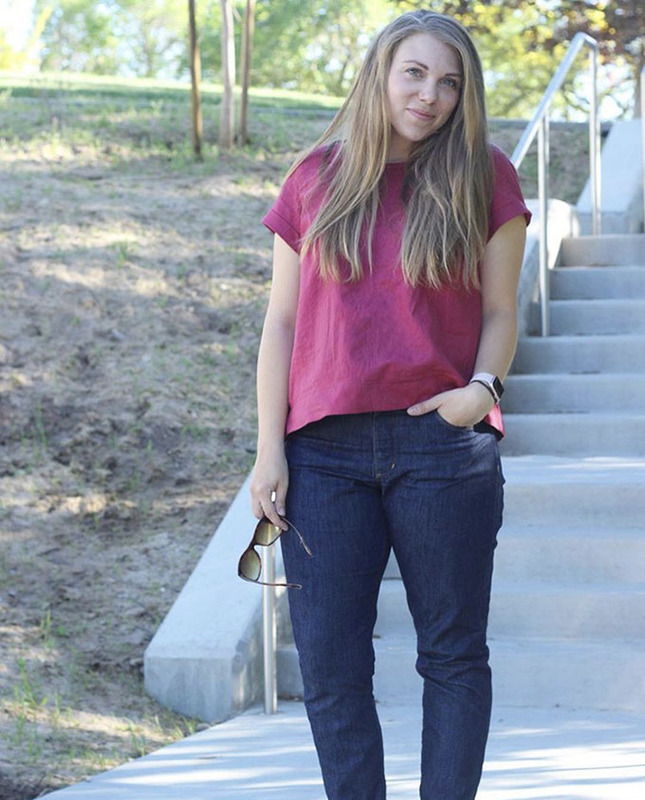 I think I'll try the Dawn jeans next year and do a full comparison for those interested. Ok, I know that's five but there are two other patterns I simply can't leave off the 'hits' list. I made this back in January during the #coatmakingparty that I hosted on instagram with Rachel and Nicole. I am sooooo glad I made this. 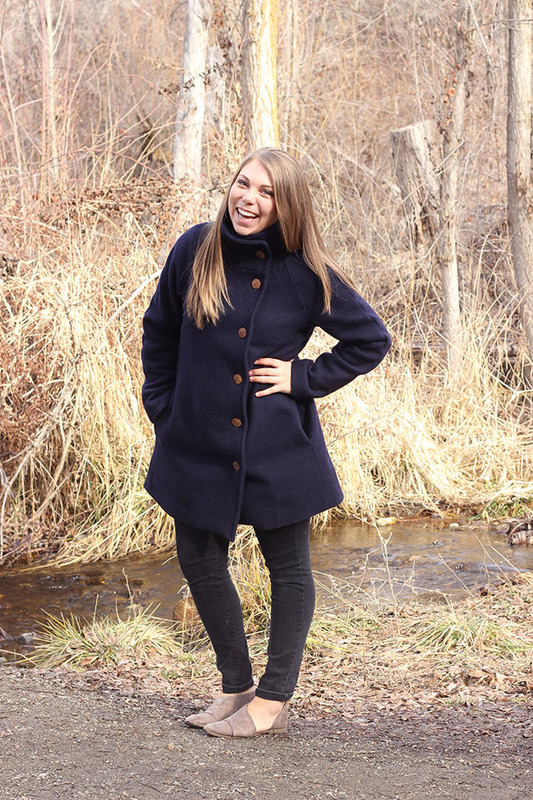 It is currently the only coat I own that will still button around my 33 week belly, and its warm, cozy and cute too. 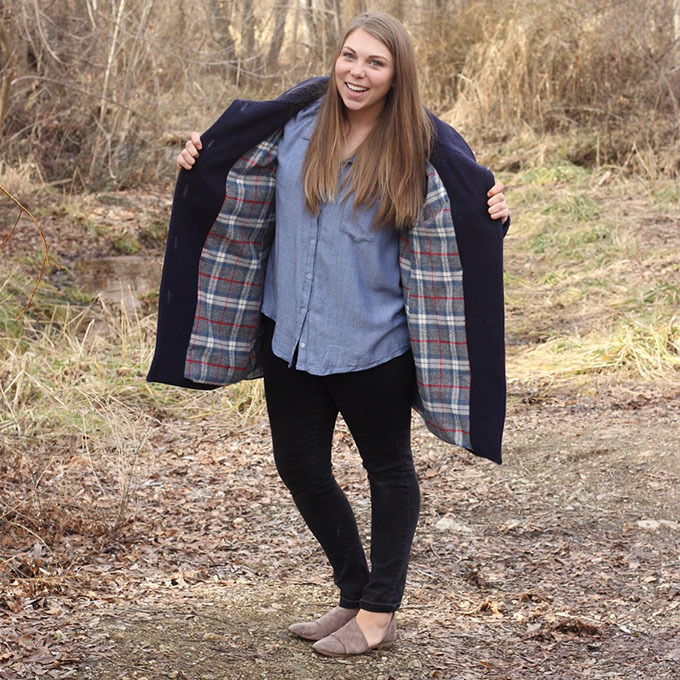 I used melton double faced wool from Mood and a Robert Kauffman mammoth plaid flannel from Raspberry Creek Fabrics with rayon in the sleeves. I wore this from January-March and now its back in heavy rotation. This was my first real coat is a fabulous pattern to start with. Its a-line so you don't have a lot of fitting to do. 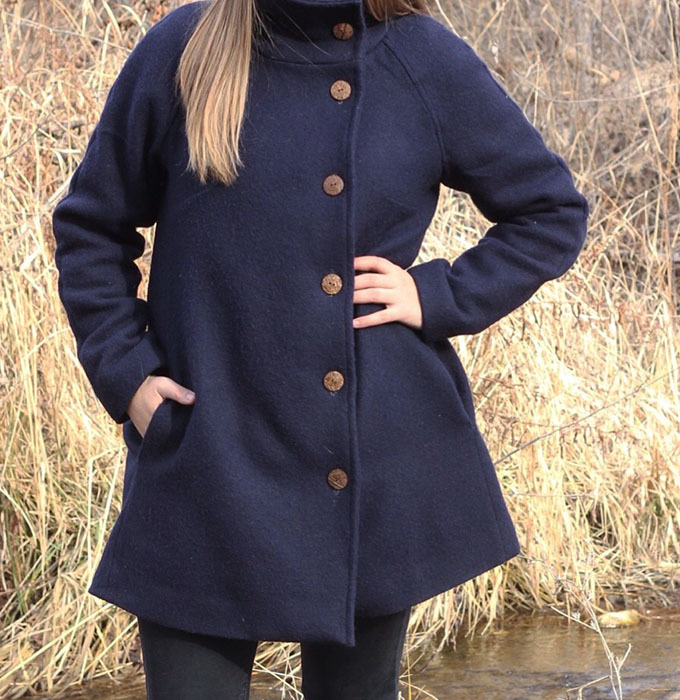 It has raglan sleeves so you don't need to ease in thick wool sleeves. Just bust darts and a two piece sleeve for a good fit. I added some fish eye darts in the back of mine because I should have done a sway back, but because the loose nature of this coat, that wasn't even essential, just my preference. I also added two, or maybe three, inches to make it a but longer for me. I seriously love it and wear it all the time. I tested this pattern back in January/February and then immediately made another. And both are definitely in the 30 wears club. 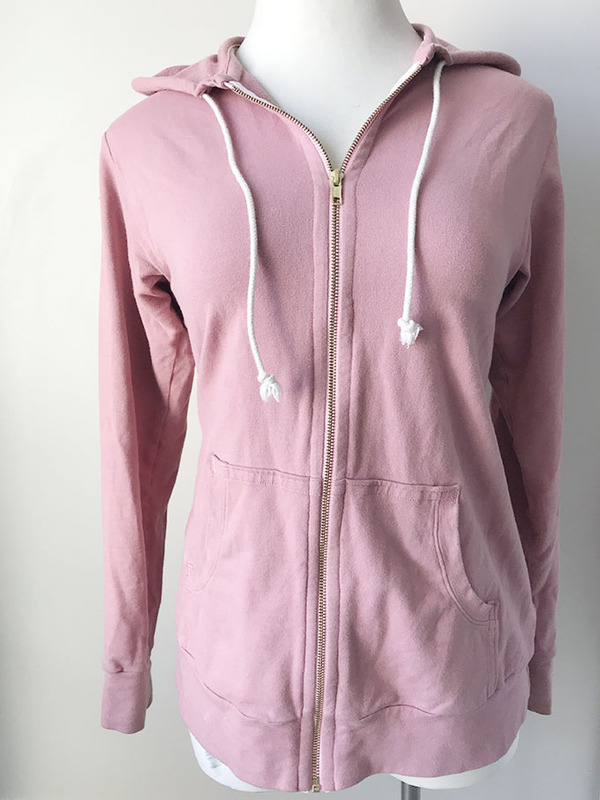 I wear one pretty much daily over a zip up Halifax hoodie to the gym. 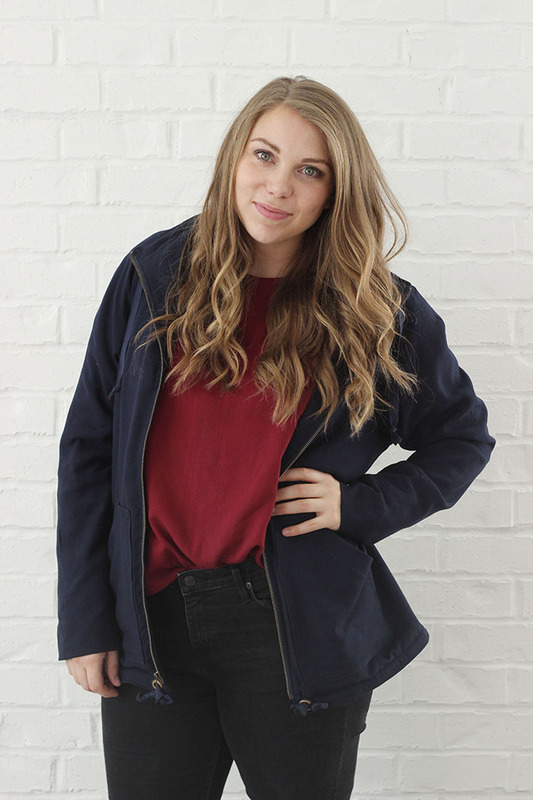 This is a great casual jacket because its fully lined but loose and doesn't require fitting. 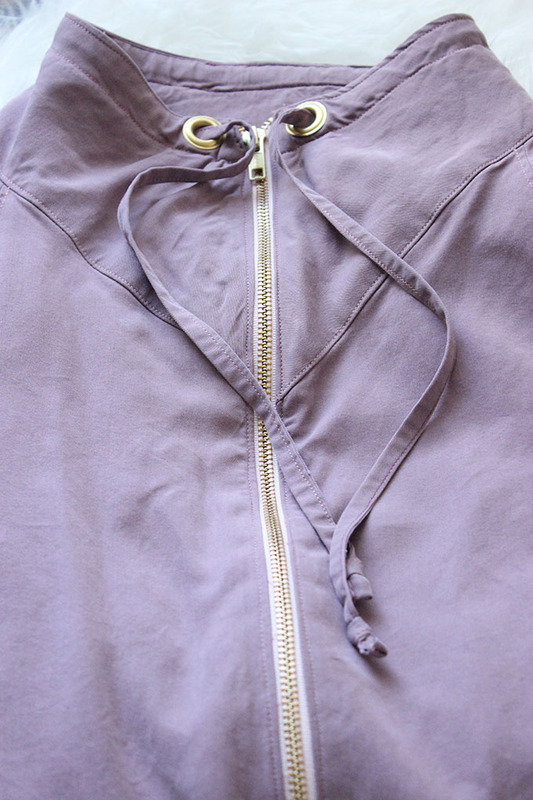 It has a hood option, two different pocket options and drawstring options as well. 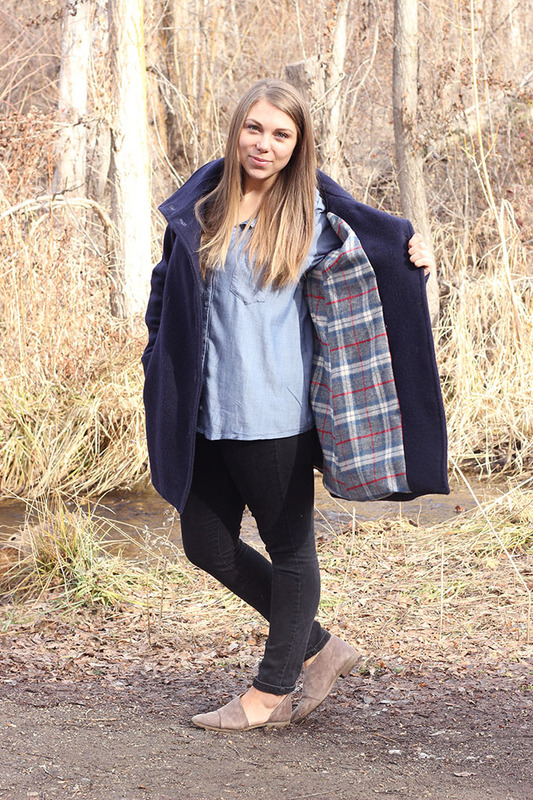 Its a total staple in my wardrobe and if you haven't made one, you should. 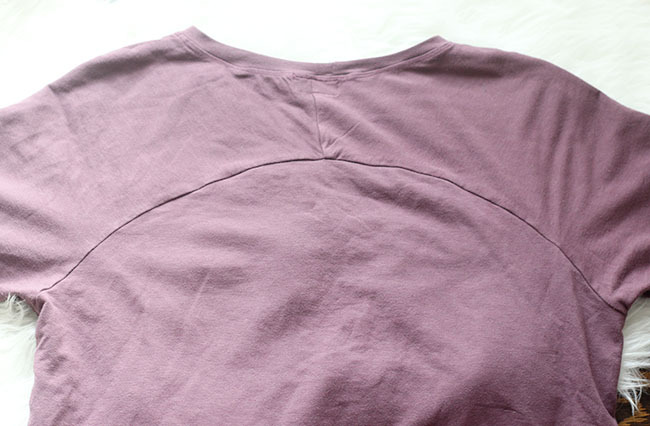 Also, I blogged about this here if you want to see and read more about sizing, etc. Ok, now I'm done. Apparently I couldn't keep it to five this year. Just too many things on my 'super successful sews' list this year! So what's on yours? Did you have any hits you just need to shout about, because I'm all ears! Or was it more of a misses year, like last year was for me? Let me know!